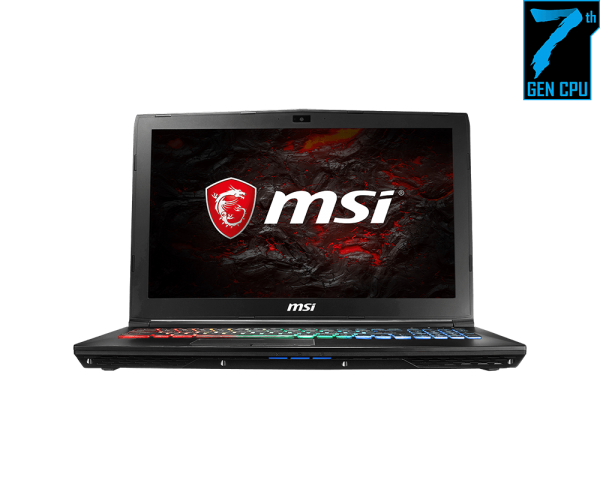 The MSI GP62-2QEi781FD also known as the Leopard Pro is a well-built gaming laptop which excels at what it does, which is to be a gaming machine. 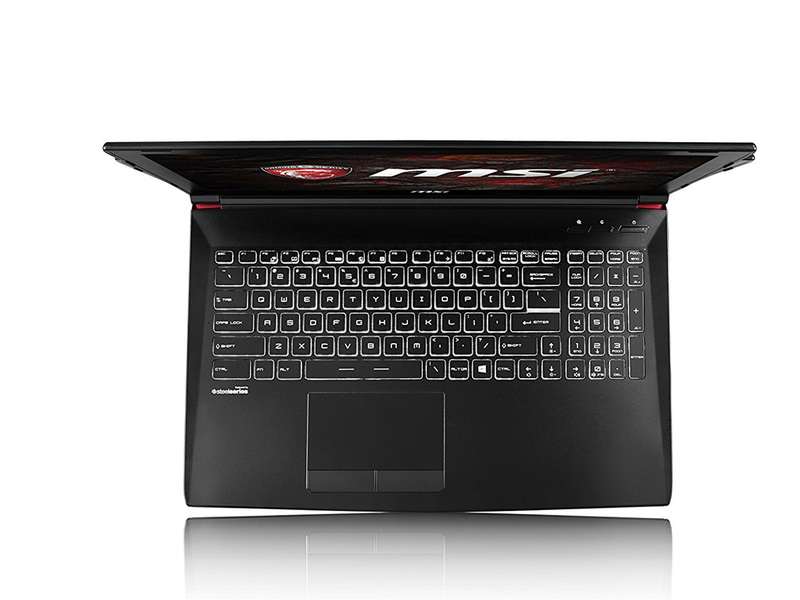 Its 17.3 inch screen is capable of displaying up to a resolution of 1920 x 1080 pixels (Full HD). Its matte surface prevents glares that would obstruct a gamer's focus. The laptop runs on an Intel Core i7 and the buyer can either pick the 5950 or 5700 processor, differing only in clocking speed. Its graphics card is the NVIDIA GeForce GTX 970M, which is the second fastest high-end graphic card in its series. Thanks to four RAM slots, up two 32 GB DDR3L RAM are available to the CPU, while the GPU either uses 6 GB or 3 GB GDDR5 VRAM. 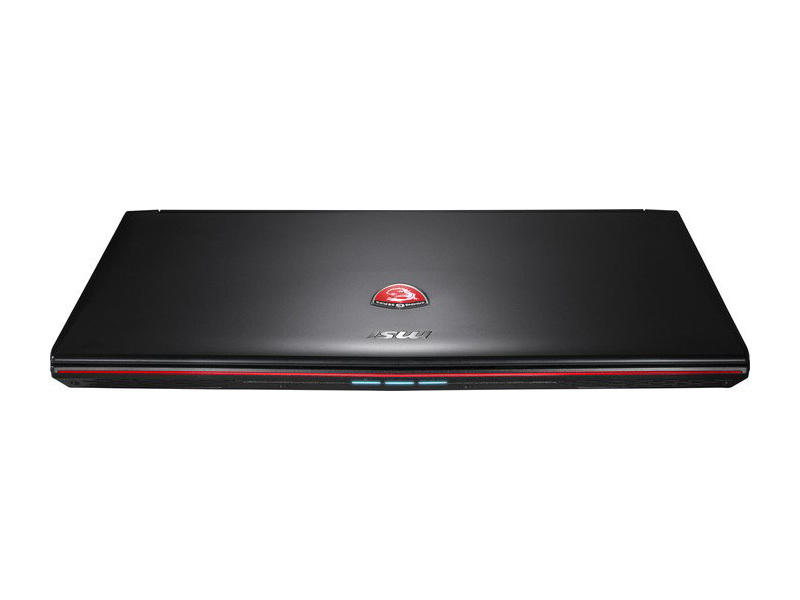 In addition, the laptop features a HDD with up to 1 TB and a built-in optical drive for CD-DVD reading. Audio is driven by Dynaudio and Nahimic sound technology, which is usual for MSI. Furthermore, the laptop comes with a Full HD webcam, which can capture up to 30 fps, and a stunning full-colour customizable backlit SteelSeries keyboard. Finally, having a 9-cell battery, it can run up to 8 hours of continuous usage and is also portable, weighing only at 3.78 kg with battery. Gaming on a tight budget. 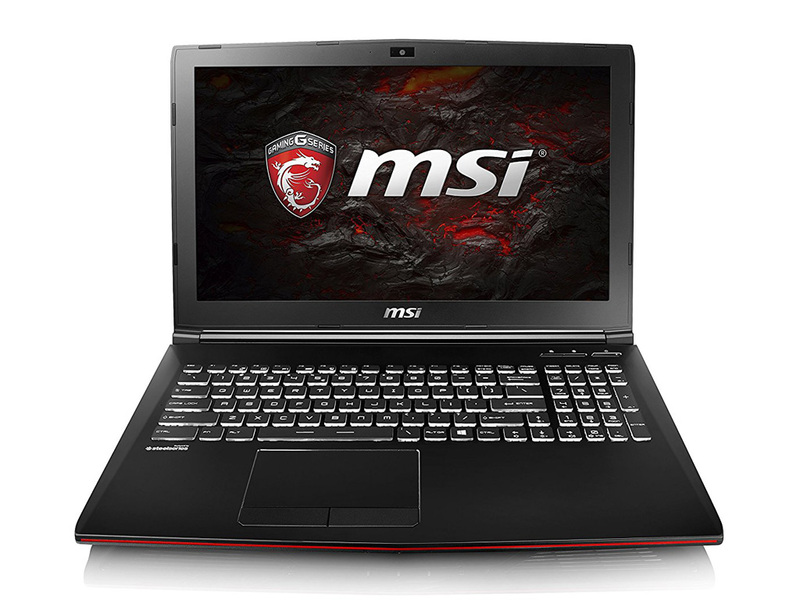 The MSI GE series is already the manufacturer's entry-level gaming series. Now, the GP series is taking that extra step to make gaming even more affordable. What exactly has been cut along the way? 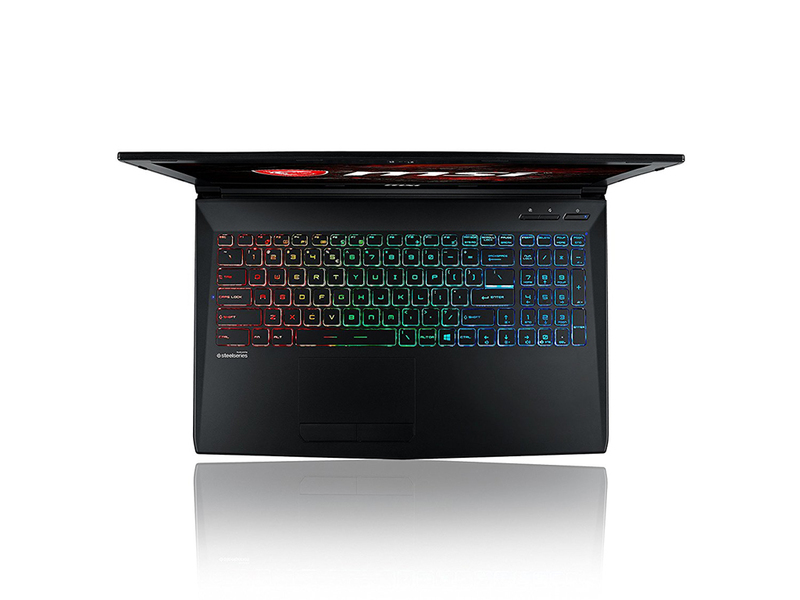 Positive: High gaming performance; metal case; good display; excellent speakers; comfortable keyboard. 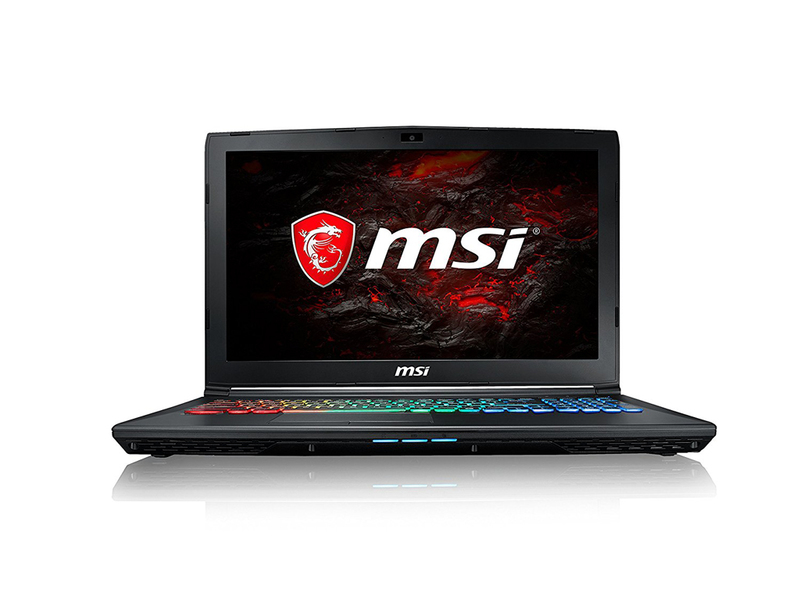 The MSI GP62 7RD-090DE Leopard is a high-performance gaming laptop refreshed with CPUs from Intel’s 7th-generation ‘Kaby Lake’ lineup. This is a solid workhorse of a laptop and would be good for professionals who need a lot of power and a big workspace just as much as gamers. 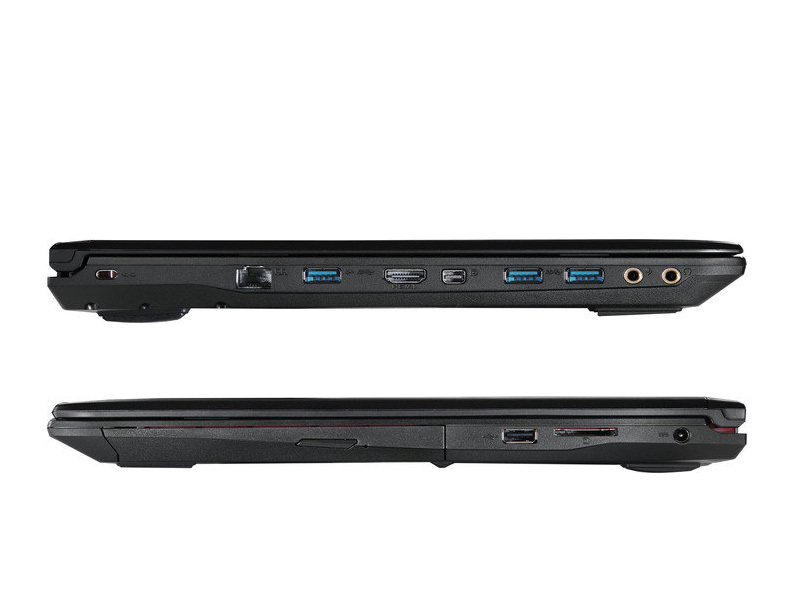 The gaming laptop is nowhere near as slim as today’s mainstream laptops. 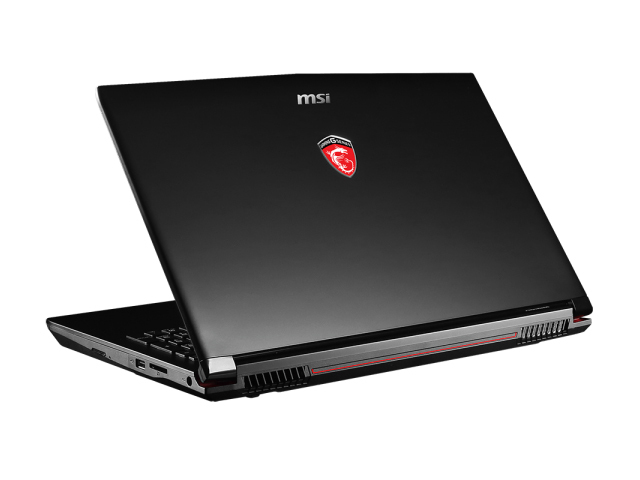 The MSI GP62 7RD Leopard has a bulky design and weighs 2.4kg. 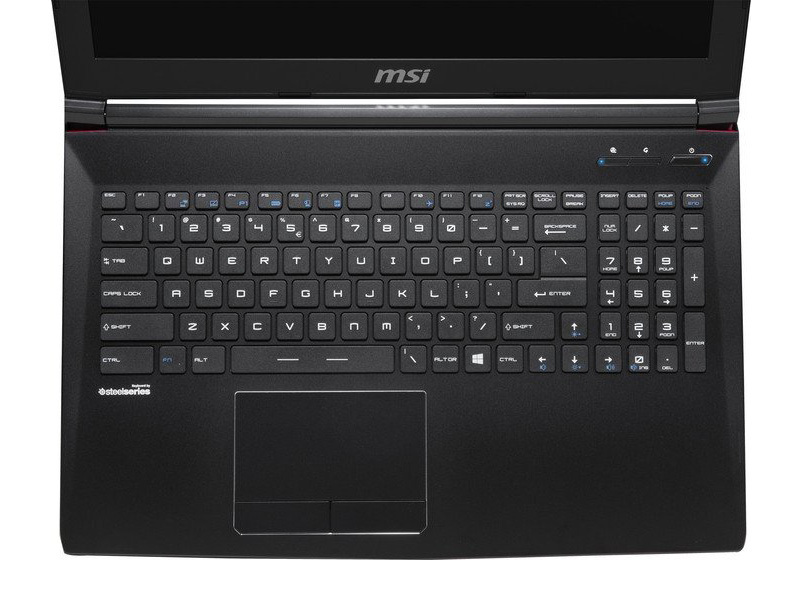 The laptop comes with a decent keyboard equipped with all the keys that can be thought of. The keyboard is designed with the requirements of professional gamers in mind. It has ergonomically-designed keys with 1.9mm of key travel for more responsive and tactile feedback, optimum WASD zone and support of Anti-ghosting capability for up to 45 keys. The keys can be used with ease even at night or in a dark room as the keyboard has SteelSeries single color backlighting. 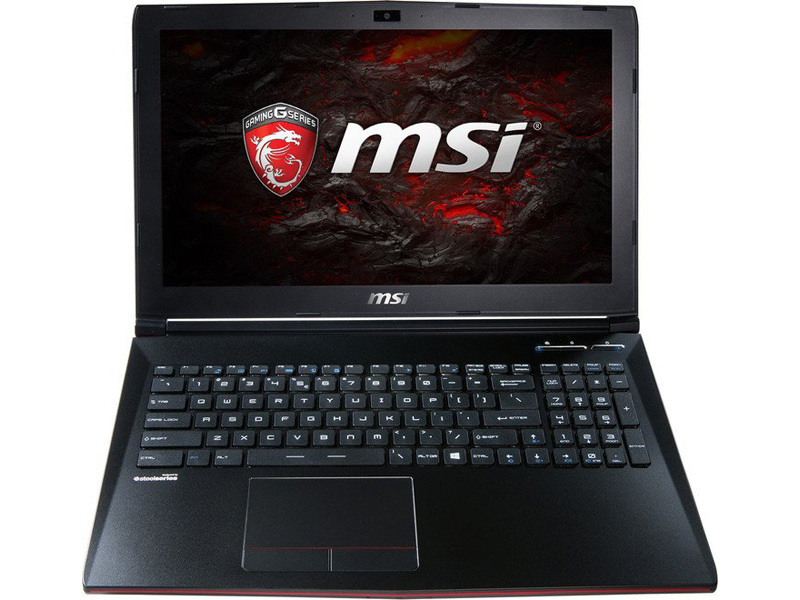 The MSI GP62 7RD-090DE Leopard has an IPS display with a higher gamut of 72% NTSC color range. It produces rich colors and has the good amount of brightness levels. The vivid 1920×1080 resolution screen is among the best displays in gaming laptops with wide viewing angle. MSI went with a non-glossy display, so users don’t have to struggle with reflections. As for the design, the laptop is relatively slick, with a lot of clever lines and angles masking this laptop’s overall bulk and making it easier to hold and carry. However, the matte black finish of the lid picked up smudges and fingerprints in no time. 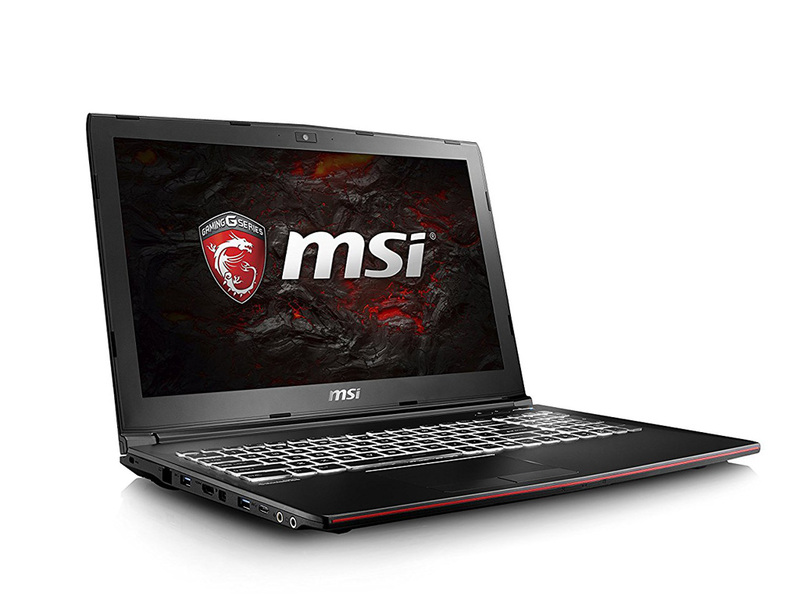 There are red accents on the front and rear, and a red MSI-“G Series” badge on the lid. Under the hood, the gaming beast is backed by a 2.8 GHz i7 Kaby-Lake CPU and a GeForce GTX 10-Series GPU combined with 16GB of DDR4 RAM. This combination makes the machine a real beast that can handle almost every type of game, as the latest generation of GeForce GPUs has improved 3D performance. 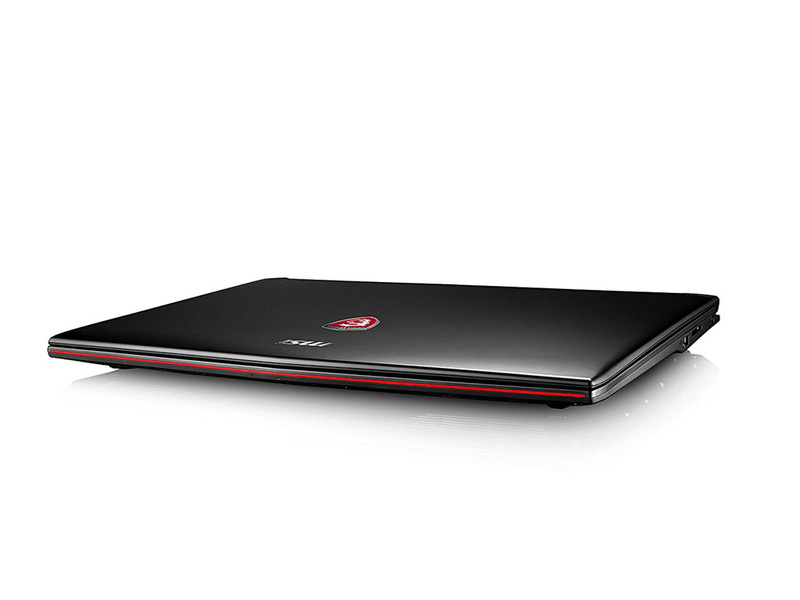 Combined with the "Cooler Boost 4" cooling solution, the laptop offers a smooth gaming experience. To further enhance the latter, the laptop also features the audio software Nahimic, which offers high-definition sound technology and boosts the audio and voice performance. For input/output ports, the laptop features an Ethernet port, two standard USB-3.0 ports, one USB Type-C port that works at USB-3.0 speed, HDMI and Mini-DisplayPort video outputs, as well as individual 3.5-mm microphone and headphone sockets on the left. 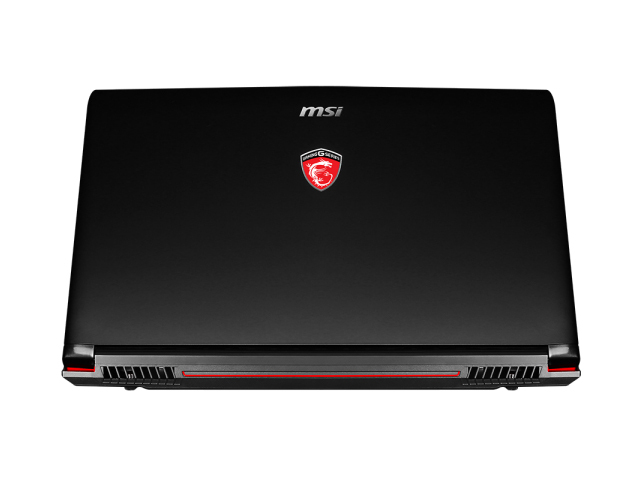 The MSI GP62 7RD Leopard Pro has a single USB 2.0 port and the DC power inlet on the right, along with an SD-card reader and a DVD-RW drive. The user will also get a Killer Gigabit Ethernet controller, AC Wi-Fi, Bluetooth 4.2, and an HD webcam. 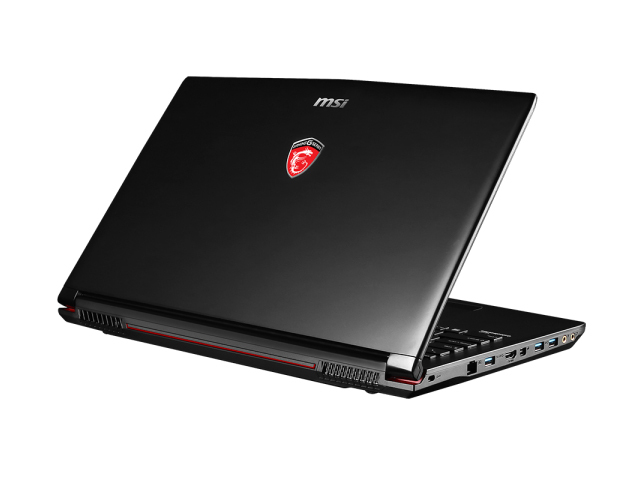 These days, MSI is known for their gaming laptops, and this is definitely one to consider if you are in the market for one. Positive: Slim size; lightweight; large screen; nice display. 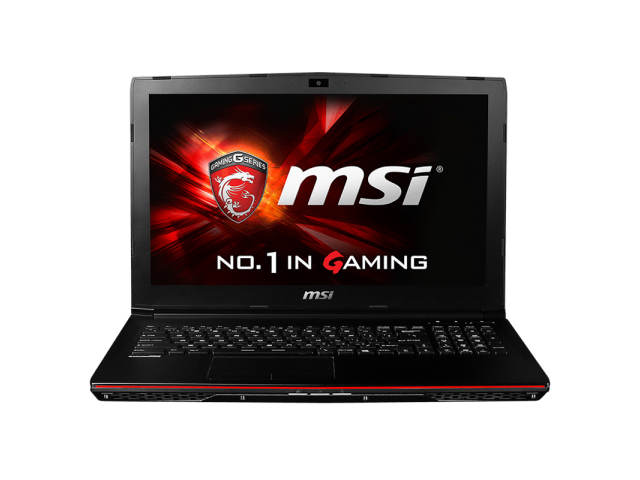 Positive: Large screen; good price; high gaming performance; decent hardware. Positive: Large screen; nice display; comfortable keyboard. Negative: Short battery life; relatively high price. Positive: Good price; powerful hardware; high gaming performance; nice speakers. Positive: Large screen; decent hardware; good price. Negative: No optical drive. Positive: Decent hardware; good price; nice performance. Positive: Powerful hardware; high gaming performance; nice display. Positive: Compact size; lightweight; good price; nice performance; decent hardware; good connectivity. Negative: Overheats while using; mediocre speakers. Positive: Elegant design; decent hardware; good price; nice performance. 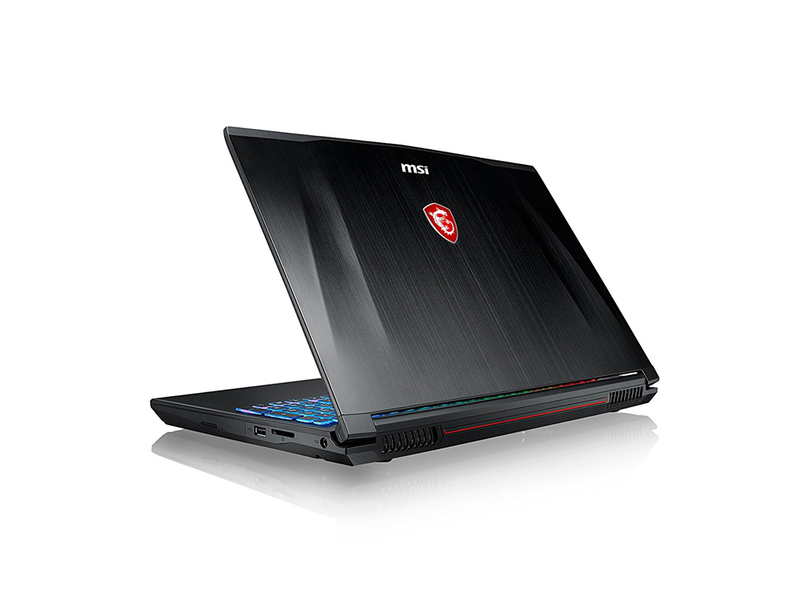 Positive: Impressive design; nice gaming performance; backlit keys; decent speakers. Positive: Large screen; nice gaming performance; good price; decent hardware. Designing a balanced laptop that offers users a satisfactory experience when they use it to play, but at the same time has a moderate price, is not easy. However, the MSI GP62MVR 7RFX-1227XES is exactly that. 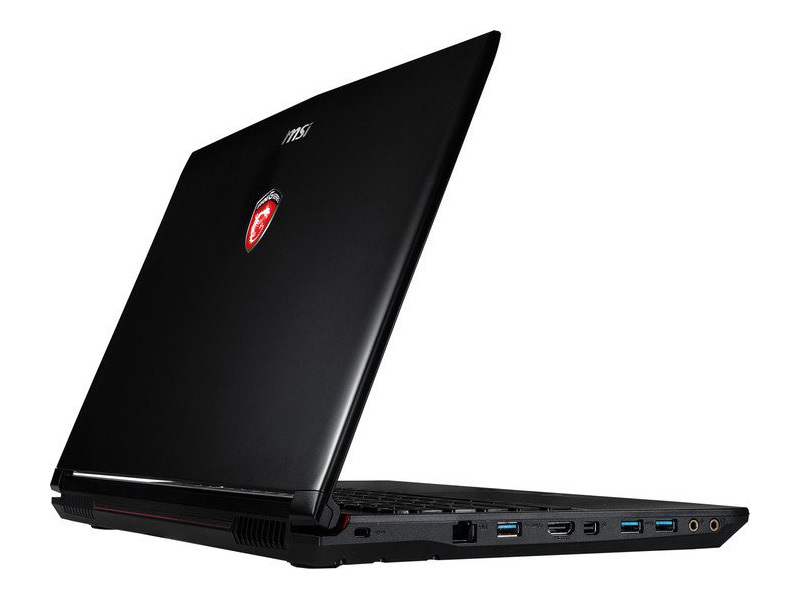 It is part of the range of access to 15.6 " gaming laptops that have an affordable price tag but also decent performance. 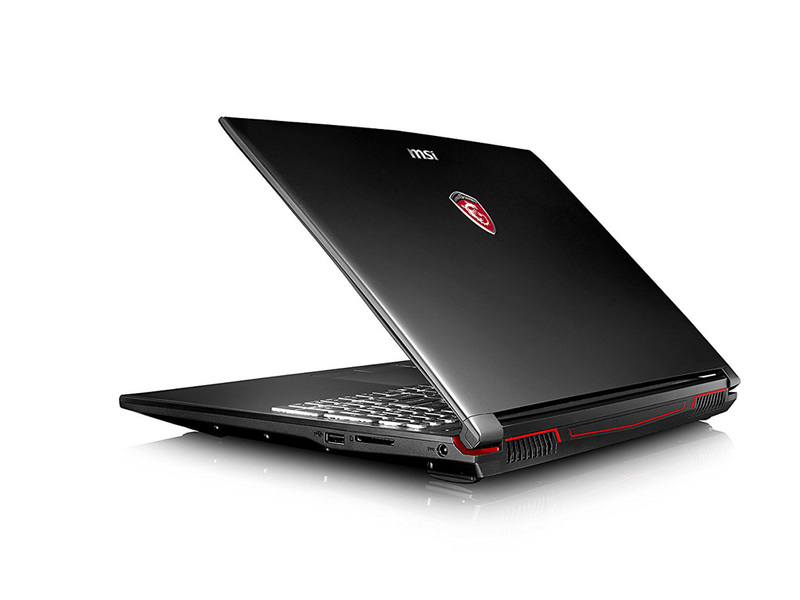 The most attractive components of this notebook are its 120Hz IPS LCD screen and its NVIDIA GeForce GTX 1060 GPU. 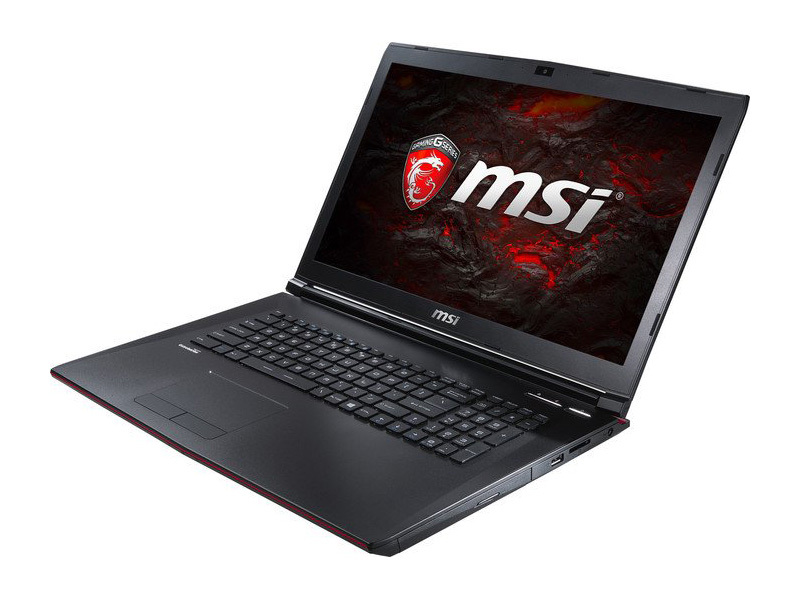 MSI engineers have opted for an IPS LCD panel with antireflective coverage and Full-HD resolution. But what makes this screen really interesting are its native 120Hz refresh rate and its response time of 3 ms, two very appealing features for a team designed to display games vibrantly. 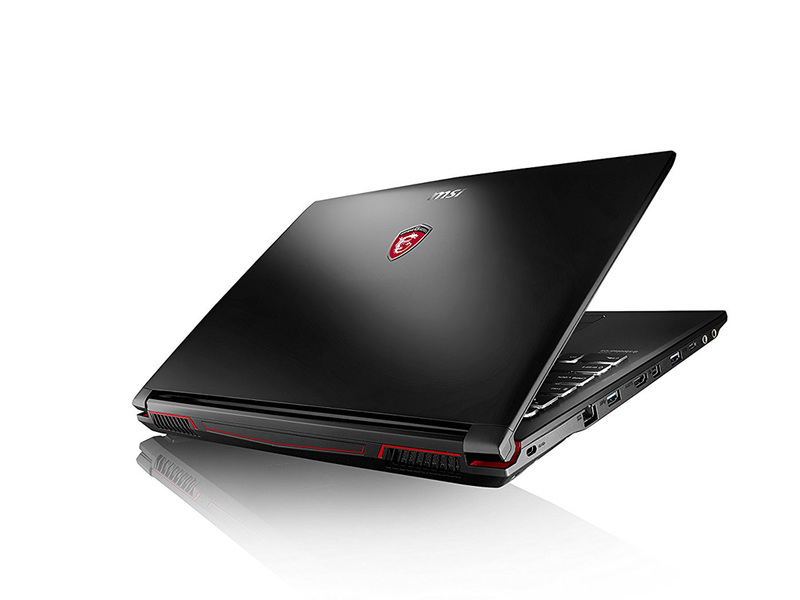 The choice of the GPU is also what users would expect in a gaming notebook, a GeForce GTX 1060 from NVIDIA backed by 3 GB of GDDR5-type memory. As far as RAM is concerned, the starting point for this model is 8 GB of DDR4. As for storage, it has a mechanical hard drive by Seagate with a capacity of 1 TB. The next component that is worth a look is the CPU. It has a microprocessor Core i5-7300HQ, not an Intel Core i7. Even so, this chip should offer an interesting performance with games, because the maximum clock frequency is usually more important in this area, which in this Core i5 is 3.5 GHz. 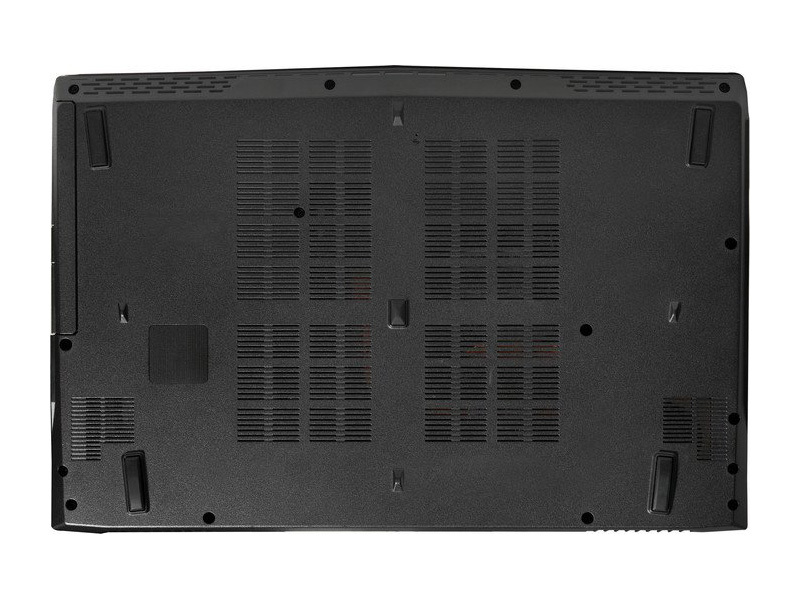 As for the design, the chassis of the laptop combines polycarbonate and aluminum alloy. The first of these materials is used at the base and side of the laptop, while the cover that supports the keyboard and touchpad is made of very good quality aluminum alloy, and with a nice touch. The back cover of the screen, which is to some extent responsible for giving structural rigidity to the laptop and also to protect the delicate panel of random impacts, is made of brushed aluminum alloy. The material used in the heat pipe responsible for transporting heat dissipated by the chips is copper. Undoubtedly, it was a wise decision, since this element has a higher heat conductivity index than aluminum. In addition, the presence of two fans of a respectable size contributes to the transfer of heat by the copper, preventing the hardware to reach the maximum temperature threshold. 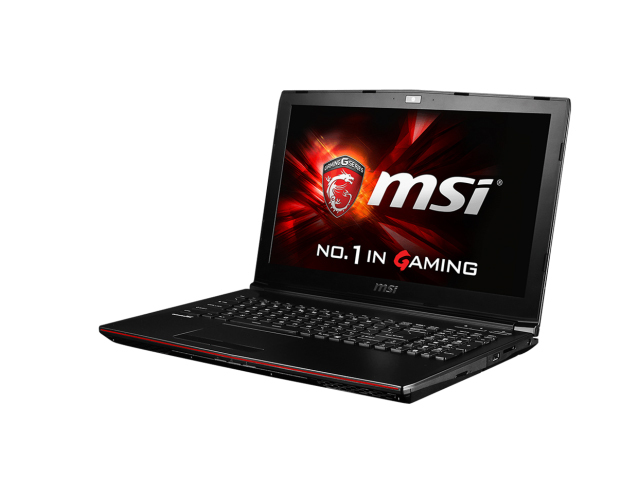 As far as connectivity is concerned, MSI has done well. This device incorporates controllers compatible with the wireless WiFi 802.11ac and Bluetooth 4.2 standards. In addition, on the left side of the chassis, users have a wide range of connectors, including two USB-3.0 ports, one USB Type-C, one mini-DisplayPort and an HDMI output capable of transporting 4K UHD signals with a cadence of 30 Hz. Unlike the left side profile, the right side only picks up a USB-2.0 port, a slot that allows users to read the contents of SD cards, and the necessary power connector. Positive: Large screen; nice display; powerful hardware; HDMI connectivity. Negative: Low autonomy. NVIDIA GeForce GTX 950M: Mid-range graphics card of the GeForce GTX 900M series, based on the Maxwell architecture.NVIDIA GeForce GTX 1050 (Laptop): Mainstream graphics card based on Nvidia's Pascal architecture and successor to the GeForce GTX 960M. 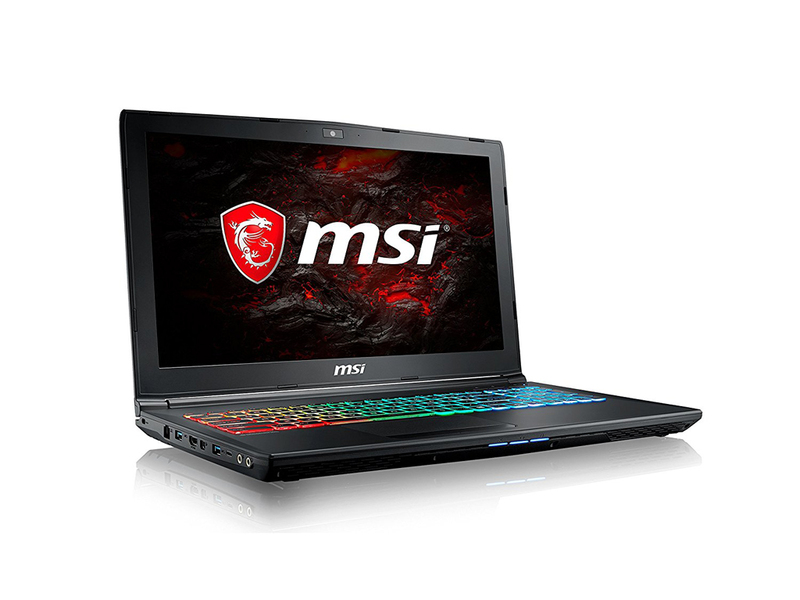 Is manufactured in a 14nm process at Samsung and the technical specifications are very similar to the desktop version.NVIDIA GeForce GTX 960M: Upper mid-range graphics card of the GeForce GTX 900M series.NVIDIA GeForce GTX 1050 Ti (Laptop): Mainstream graphics card based on Nvidia's Pascal architecture and successor to the GeForce GTX 965M. Is manufactured in a 14nm process at Samsung and the technical specifications are very similar to the desktop version.These graphics cards are able to play the latest and most demanding games in high resolutions and full detail settings with enabled Anti-Aliasing. 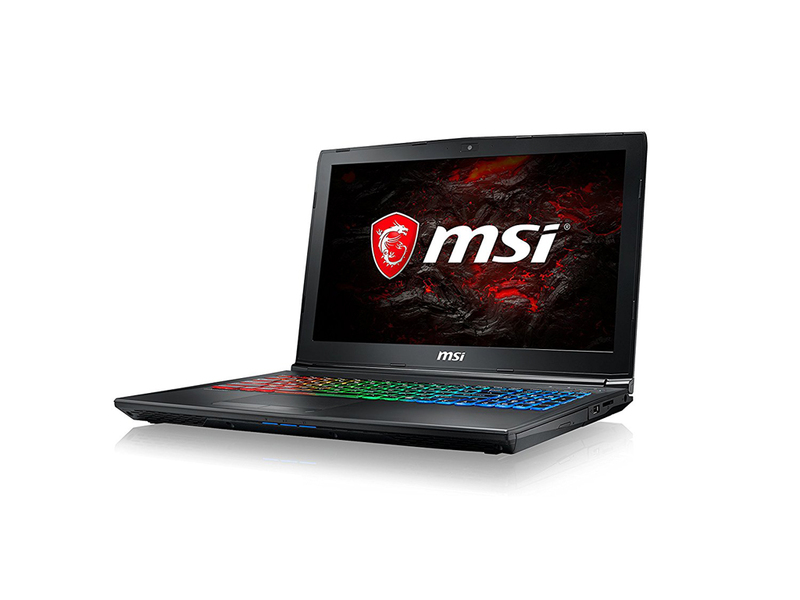 NVIDIA GeForce GTX 1060 (Desktop): Pascal based desktop graphics card with GDDR5 graphics memory.NVIDIA GeForce GTX 1060 (Laptop): The mobile GTX 1060 is based on the GP106 chip and offer 1280 shaders. Compared to the identically named desktop version it features a slightly lower clock rate. Games in Full HD and maximum details should run fluently on the card.» Further information can be found in our Comparison of Mobile Graphics Cards and the corresponding Benchmark List. 7300HQ: Quad-core notebook processor based on the Kaby Lake architecture running at 2.5 - 3.5 GHz without Hyper Threading (which is supported by the faster i7 CPUs). The chip also integrates the HD Graphics 630 GPU clocked at 350 - 1000 MHz and is manufactured in a 14 nm process (improved compared to Skylake). 78.58%: This rating is not convincing. The laptop is evaluated below average, this is not really a recommendation for purchase.» Further information can be found in our Notebook Purchase Guide.